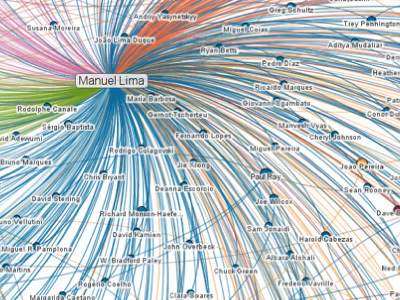 Developed by Linkedin Labs, InMaps provides a visual representation of your professional Linkedin universe. 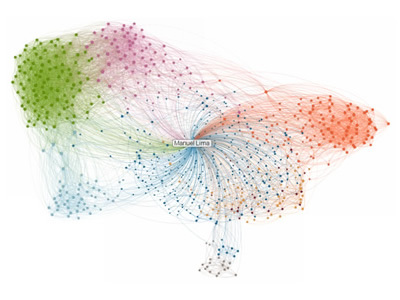 This appealing visualization tool allows anyone with a Linkedin account to map their professional ties and is a great way to understand the relationship patterns between you and your entire set of LinkedIn connections. The map is color-coded to represent different affiliations or groups from your professional career, such as your previous employer, college classmates, or industries you've worked in. Bigger names represent people who are the most connected within that specific cluster or group. When you click on a contact within a circle you'll see their profile pop up on the right, as well as lines highlighting how they're connected to your connections.